The original manager’s villa burned down in 1914 and was replaced by the building that is now home to the museum. As well as housing the station manager and his family, the villa at Grytviken was the administrative centre of the station. A number of other staff lived here over the years, including a priest, chemist, steward and doctor. The station foremen had a common room at the back of the ground floor. On the first floor there was a chemistry lab, where analysis was carried on the whale oil products. There were comfortably furnished public rooms for the manager and senior staff, complete with numerous houseplants carefully tended by the steward. A safe was added to the building for the safekeeping of money and alcoholic spirits, which were the preserve of senior personnel at the station but officially off limits to most of the workers. The villa continued to be the centre of management at Grytviken until whaling ceased there in the 1960s. The building would be dormant for over twenty years until it found a new use as the home of this museum. 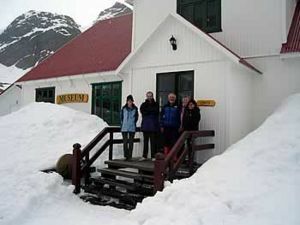 The idea of a museum on South Georgia was first suggested in 1989 by David Wynn-Williams, a British Antarctic scientist. The original plan was to locate the museum in the manager’s villa at Stromness station, however, Grytviken was eventually chosen as a more suitable site. The project was taken on by Nigel Bonner, the former deputy director of the British Antarctic Survey. Nigel had extensive experience of South Georgia, having lived and worked here in the 1950s and 1960s. Under the auspices of William Fullerton, then Governor of the Falkland Islands and Commissioner of South Georgia, Nigel directed the early restoration of the manager’s villa at Grytviken and the installation of exhibits. The South Georgia Whaling Museum was opened to visitors in 1992. Nigel enlisted the help of Ian Hart who worked as Curator of the Museum from 1992 until 1995. Sadly, Nigel died in 1994 before he could finalise his plans for the development of the museum and its collection. This mantle was taken up by Robert Burton, who was director of the museum from 1994 until 1998. During this time major improvements were made to the fabric of the museum, the “Little Villa” next door, and the church. Many more artefacts were also added to the collection. The museum and most of its collection are owned by the government of the island, which has spent considerable time and resources restoring and improving the buildings, and making the whaling station safe for visitors to look around. Major renovation work on the villa took place in the 2006/7 season with a new roof put on and new windows and flooring added. Under the management of Tim and Pauline Carr the museum developed to provide a more general summary of the island. In addition to the original displays on whaling, new displays on discovery and exploration, natural history, administration and military conflict have been added. In 2006 South Georgia Heritage Trust took over the management of the museum. Among the new trust’s aims are the improvement of documentation and collections care, and the development of an online database of the museum’s collection. From its humble early beginning, South Georgia Museum has grown into a great resource for the thousands of people who visit the island every year, as well as many others around the world who make enquiries or access our online collection. This page was last modified 13:30, 10 January 2012. This page has been accessed 55,037 times.